A largely new volunteer team suceeded in clearing not only our 3/4 mile of branch line formation - but carried on for a similar distance again beyond our boundary! (With thanks to Lafarge for their permission to do so). The funds to do this were also raised by the same team. Resumed restoration in earnest on teak 24278, such that it is fully panelled by the ned of the year. Part repainted the body and roof of Post Office Sorter 70294E. 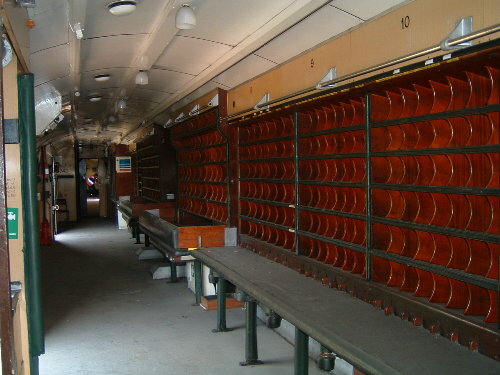 Revarnished Pigeon Van 4050, and returned its roof to white! It was then purchased by RVP following a successful grant application and appeal. Considerably improved the appearance of our stored stock, with major work to make the "Flying Scotsman" coach (18033) presentable from passing trains, and taupaulins fitted to all of our other stored stock. Won the quiz at the Steam Railway gala! All of the above was completed by our membership (with minimal contractor assistance where appropriate), fuunded only by donations, a few grants, and money the membership are happy to trust us to spend on their behalf. To all involved, whether directly, through arm-chair support, or in the wider GCR community, many thanks and we hope you consider it well worth the effort. There are more highlights to come in the not too distant future (the first train on the Mountsorrel branch, a complete Mark 1 TPO set in original livery, a second teak coach in service, the Beavertail at Llangollen, etc, etc). Please continue to support us into 2009. 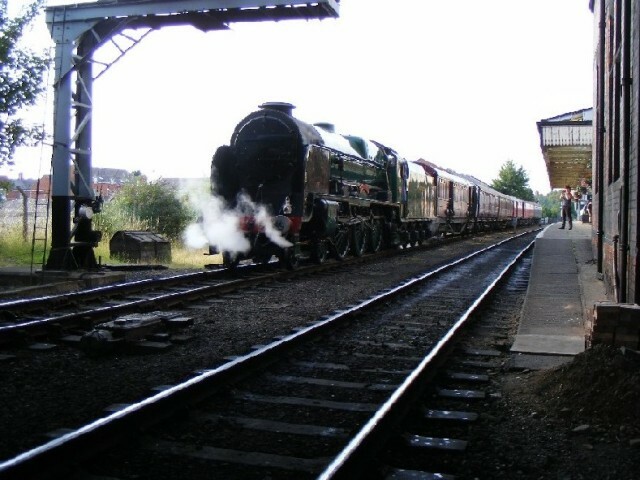 The photo shows our 40th Anniversary train approaching Rothley behind "Leander". The newly varnished pigeon van 4050 is the front vehicle. The photo was sent annonomously - if the photographer would like to get in touch I'll credit it appropriately. UPDATE - Yesterday's AGM was the best attended for many years, with the majority attending then going on to join the anniversary dining train. 73 members and guests travelled, and prior to the departure a short ceremony was held to mark the transfer of ownership of Pigeon Van 4050 to RVP Ltd. This vehicle has had an internal plaque fitted to commemorate its former owners Ted and Doll Maslin - who did much to ensure RVP survived through many difficult years in the past. 4050 then formed the front coach of the anniversary train, hauled by "Leander" with appropriate headboard - some pictures from the day are HERE (In word format). The image on the left is a group photo of part of the group - there were many who didn't fit in this picture. 40th ANNIVERSARY - ANNUAL GENERAL MEETING AND ANNIVERSARY DINNER. This years AGM is this Saturday. Members and Sahreholders should have recieved the notice of the meeting - it will be held in the function room of the Great Central Hotel. On the same day, at around 12:30 we intend to complete the purchase of Pigeon Van 4050 at Loughborough Central. This should be formed as the first vehicle in the dining train, which will then leave for our anniversary dinner at 13:15. Only members and guests pre-booked will be able to travel on this service. The Beavertail car is expected to be ont he other GCR trainset that day for the use of AGM and dining train guests, and the general public. ... and completed. 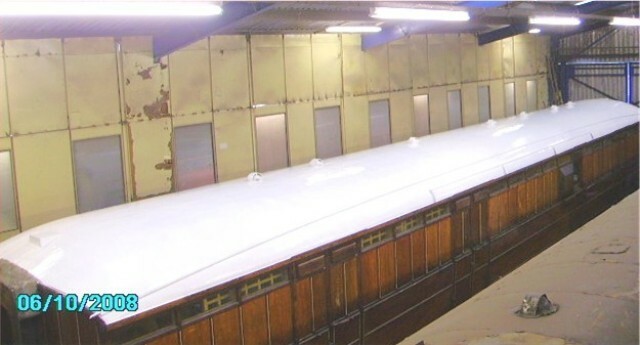 The result is magnificent and restores the roof to its bright white again (which will be grey again by the weekend - thats the problem with steam locos!). Many thanks to all who responded to the call for help on this work. 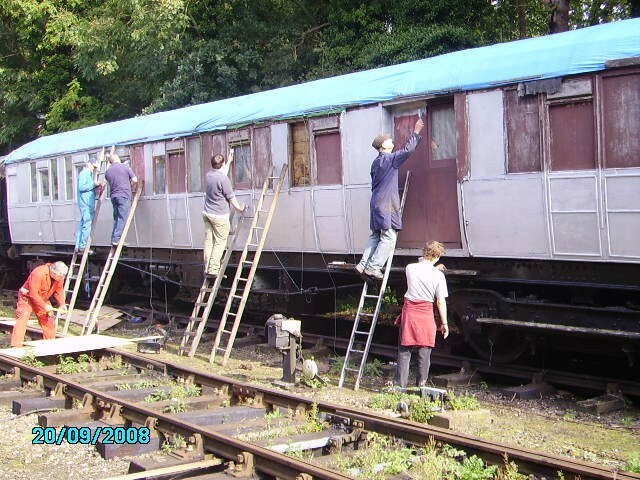 The coach will return to Rothley after the gala for bodyside revarnishing. This vehicle is being sold to RVP by its owning family. 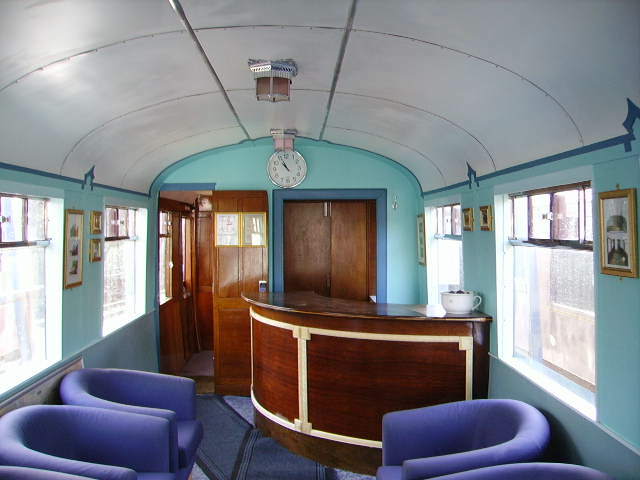 To do so we need to raise £3000 to complete the purchase and ensure it remains on the GCR. If you would like to donate please send cheques to 26 Cliff Park Avenue, Wakefield, WF1 2DW with "BGP" on the back. AUTUMN GALA - The forthcoming GCR gala this weekend (10/11/12th) will feature two TPO runs each day using the mark 1 TPO vehicles. In addition the LNER TPO set will be on display and open for visitors at Quorn. Apparently there are also some impressive locos in use too! On the saturday night the GCR will stage another of its excellent night events at Quorn, with an intensive service at dusk including a "Night Mail" TPO. PROGRESS UPDATE - Recent volunteer activity at Rothley has concentrated on tidying the appearance of our stored stock there. This has included fitting taupaulins to the roofs of 62565 and 9116 to keep the worst of the weather out while they wait their turn in the restoration queue. Meanwhile last week saw a concerted effort to tidy the appearance of "Flying Scotsman" train survivor no.18033. This has had new panelling fitted to make it presentable, and is currently painted in primer. It will go maroon shortly, thus significantly improving the view from passing trains. This work is mainly cosmetic, but it will also help keep the vehicle watertight until the day we are able to start the major restoration this historically significant vehicle requires. The volunteer team have achieved a significnat milestone; the removal of the final tree in the way of the formation. This now means the trackbed is essentially clear from the junction with the GC line at Swithland through the RVP boundary to the edge of the Lafarge quarry around 1.5 miles away. The photo shows the team resting on the tree, just short of Wood Lane bridge. It is important to note that this location is on Lafarge property, RVP / GCR members should not access this area unless as part of an organised working party. The volunteer team will now move back to the RVP section to complete some tidying of the site as we move towards the track laying phase. Clearance continues on the formation of this former branch line. The volunteer team have concentrated recent efforts on the section beyond RVP's boundary, running past Nunckley Hill quarry itself, under Wood Lane, and ending at a point just short of the main (working) quarry at Bond Lane. This is the section of formation referred to in the 15th June press release (see below) - it is owned by Lafarge, but they have granted permission for it to be cleared to make the formation available for future use. This work is not funded by RVP (donations to the project are applied only to our section), but the volunteer teams willingness to work with Lafarge on this no doubt encouraged the significant donation of ballast which RVP will recieve in due course! With clearance work nearing completion on the Lafarge section, the team will return to RVP property to continue preparation of the trackbed. In the meantime track design is being finalised ready to move forward. Photo showing Wood Lane bridge from Nunckley Hill quarry<. 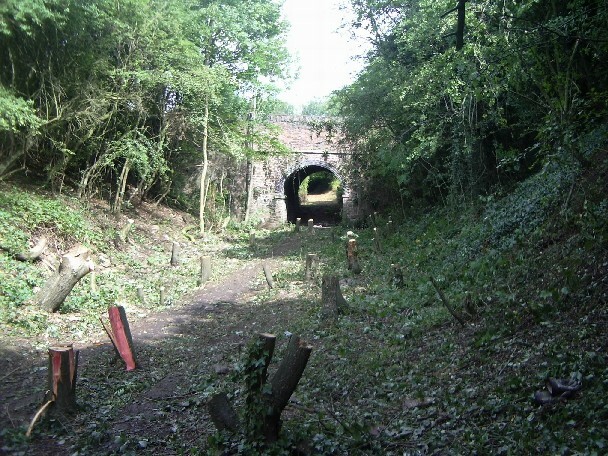 Photo showing the end of the formation at Bond Lane bridge (formation ends at the bank beyond the bridge - about 1.5 miles from Swithland sidings). ... and BR vehicles to the rear. Hauled by "Lord Nelson", both vehicles fitted with exchange equipment were used; the LNER sorter dropping two bags and picking two up, 80301 (three coaches further down the train) dropped two more bags. Some last minute changes to the timetable, because of the restricted space available for shunting, gave a bonus appearance of the two sets also combined during the afternoon for a run from Rothley to Loughborough - and on the Sunday the final run of the LNER set saw the Mk1s taking for the ride as well (although not exchanging mail on that ocassion), making quite a load for 2MT 78019! On the down side, the shunting constraints meant Motorail van 96202 couldn't run - but it was displayed in Rothley yard throughout the weekend. All in all a successful weekend and a great display to mark our 40th anniversary. To finish a couple of group photos. FINAL RUNS FOR LNER TPO SET / FIRST RUNS FOR 80349 - the timetable for the forthcoming Mail by Rail gala (this weekend) is now shaping up. There will be four TPO mail exchange runs each day, with an extra on Saturday night. The expected formation of trains (subject to availability on the day) means that the first three TPO runs each day will be the Mark 1 TPO set, featuring 80349 making its preservation debut in its polished red livery. It will be joined in that train by 80301 (with the exchange equipment), and two other vehicles from our collection. 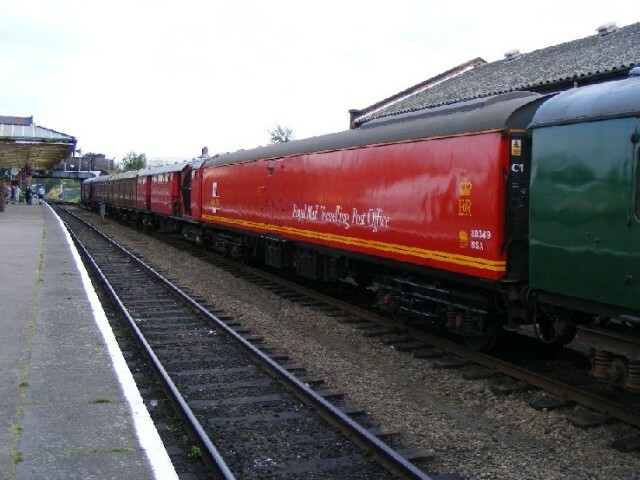 The LNER TPO set will operate on the final (late afternoon) train each day - performing its final mail exchange at Quorn on the Sunday afternoon around 4.15pm. 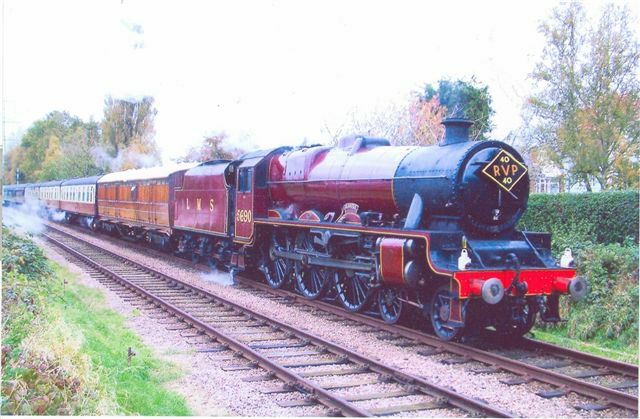 The Saturday evening sees a unique and very special event for RVP to mark our 40th anniversary - both TPO sets will be combined for a full round trip of the line, including a mail exchange at Quorn (around 7.10). In this it is expected that 80301 will drop bags while 70294E will pick them up. This train will represent the longest formation of serviceable RVP vehicles we have been able to assemble and (with the withdrawl of the LNER TPO set immediately after this gala) it is likely to remain a one-off. The vehicles in that train will be a rather colourful(!) representation of the significant investment in time and money made by those who have supported RVP over our 40 years. If you have been one of those supporters and can be at Quorn that night please do come and see what your support has achieved. 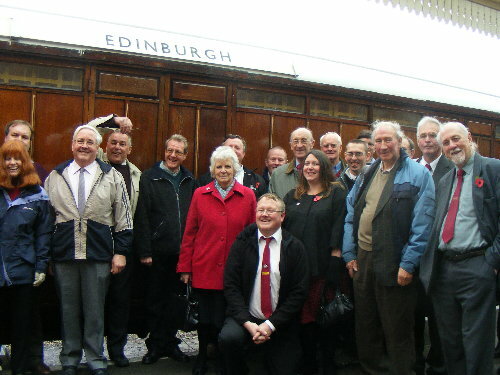 We also record our thanks to the GCR for arranging for this train to run. WORK CONTINUES in preparation for the forthcoming gala (26/7th July). LNER sorter 70294 is now having a coat of gloss on the West side - looking much better for it. New acquisition, Mark 1 sorter 80349, has had vacuumm brakes fitted - the underframe is having a quick repaint and an attempt will be made to polish the nodysides in the exisiting Royal Mail red livery. Meanwhile long stored "Flying Scotsman" coach 18033 is having some basic body side repairs to make it more presentable from passing trains. The roof had some taupaulins fitted to it a few weeks ago to keep the worst of the weather out. 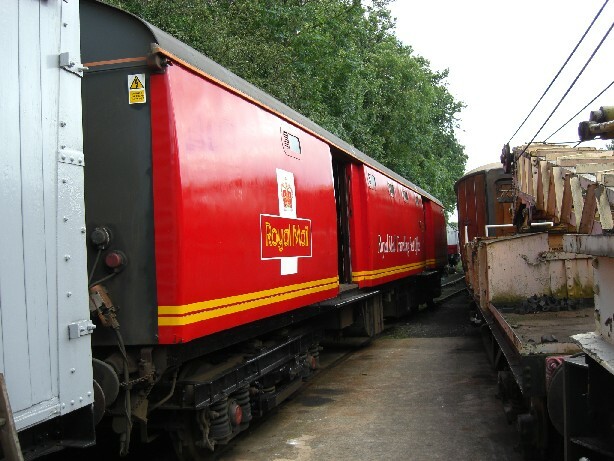 TPO WORKS - In preparation for the forthcoming Mail gala (see below) we are currently busy preparing the vehicles at Rothley. LNER 70294E has had various mechanical defects attended to and is having a quick repaint - as this attractive (!) photo shows. Its partner 70268E has also had minor mechanical repairs and both now awaut a fitness to run exam by GCR staff to determine if they are fit to run at the gala. Meanwhile new Mark 1 TPO , 80349, is now at Rothley. This is the best of the new arrivals and is having vacuum brakes fitted to allow it to operate in the gala with 80301. 80349 is the best of the new arrivals and we are confident it will be fit to operate in the gala (taking the place of 80458 which needs more extensive body work). 19th JUNE 2008 - MAJOR GALA COMING SOON! Its our 40th Birthday this year and the Great Central Railway are helping us celebrate it in style - as this recent press release shows (hit BACK to return after reading it). The gala on 26/7th will see all of our operational stock in use including two seperate TPO sets (Mark 1 and LNER) performing a regular demonstration of the exchange equipment. The weekend will see the last runs of the LNER TPO vehicles in public service; they will then return to semi-retirement in view of their frail condition. 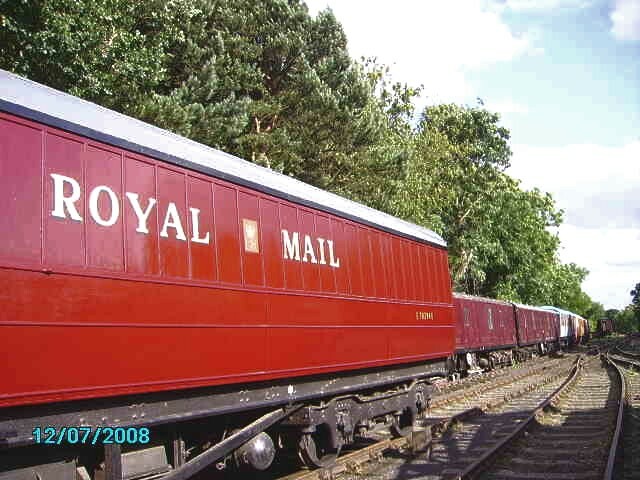 We will maintain them for display purposes and the GCR will continue to move them around as required, but we don't expect to be able to use them for mail exchanges in the future. We intend to run all of our operational vehicles in one train on the Saturday night, completing a mail exchange on the way. If you've donated to any of our appeals do come along and see what your money paid for. The GCR will, of course, provide the usual excellent setting and motive power and it promises to be an excellent weekend. ... and tender 80438 show the excellent condition these vehicles were recieved from EWS in. Sorter 80301 - built 1959 to the original style (with larger windows), now fully restored to 1959 condition with exchange equipment. Brake Tender 80458 - built 1967 to the later (small window) style. 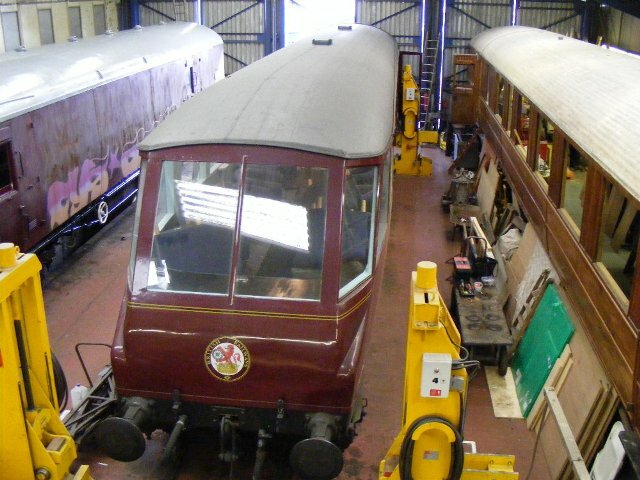 This arrived ont he GCR earlier in the year and is now having vacuum brakes fitted, and may enter service in July. 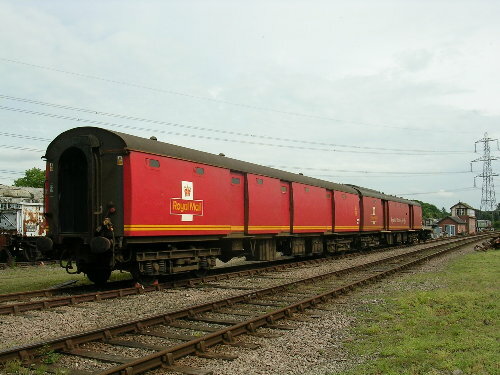 Sorter 80349 - representing the later style of sorter, with smaller windows and no exchange equipment - now on the GCR and to be vacuum braked over the coming year. Tender 80438 - a later style tender (the more common type without brake) - again to be fitted with vacuum brakes in the coming year. These vehicles, together with the serviceable LNER pair, give us the most comprehensive collection of working TPO vehicles in the UK - something we hope to demonstrate extensively at the forthcoming "Mail By Rail" gala on 26/7th July (more detail to follow). The journey of the last two from Euston to the GCR has involved a few twists and turns, with periods stored at Euston and Wembley before finally moving to Old Oak Common last week. This final move (perhaps the last ever TPO movement on the national network?) had a reporting number of 6V67 (fittingly close to the appeal title!) and apparently involved more locos that coaches! If any one has a photograph of this movement we would love to see it. 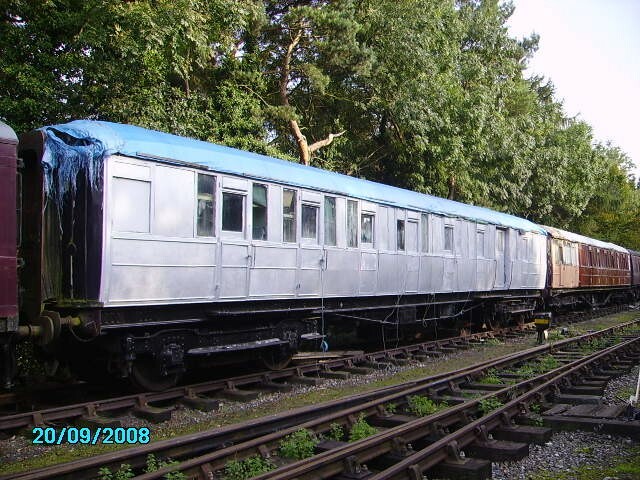 The coaches are now safe on the GCR and it only remains to thank those involved; Paul Harrision for arranging the move (and negotiating a reduced fee), Nigel Harris (GCR) and EWS for getting a storage location agreed, and (of course) all who donated to the appeal to save them. NUNCKLEY HILL PROJECT - BADGER PROBLEM SOLVED - It is very pleasing to report that, following a further survey of the site and subsequent visit by DEFRA officials, a licence for the closure of the badger sett has now been issued. This means that clearance work can now proceed in the badger sett area, thus completing the basic clearance of the whole of our section of the formation. It should also be pointed out that the badgers will not be harmed by this work; the sett was being used only by visitors and these will simply use other setts elsewhere on the site.With all obstacles and planning issues legally dealt with, THERE IS NOW NOTHING TO STOP THE BRANCH BEING COMPLETED AS QUICKLY AS TIME AND FINANCE ALLOW. The group of volunteers is now well into double figures most weekends and the progress is very clear to see from passing GCR trains. The fund raising to date will be spent when we order a large quantity of track materials (by the time you read this). This will represent just a fraction of the total materials needed to complete the branch - we urgently need more funds. If you were waiting for an assurance that the project would be completed then I can happily give that assurance. PLEASE MAKE A DONATION! BEAVERTAIL AWARD PRESENTATION - The Heritage Railway Association will be presenting the "Small Group Award" for the restoration of the Beavertail Car to us at Loughborough station this coming Saturday 12th (10am). All are welcome to see the award presented, particularly those involved in the funding and restoration of this vehicle. Sadly we have to report another death - ROBIN DOUST died at 2am on the 12th March 2008 at Mater Dei Hospital, Bulawayo, Zimbabwe.Robin was our second chairman resigning when he moved to Africa in 1975 on medical advise. 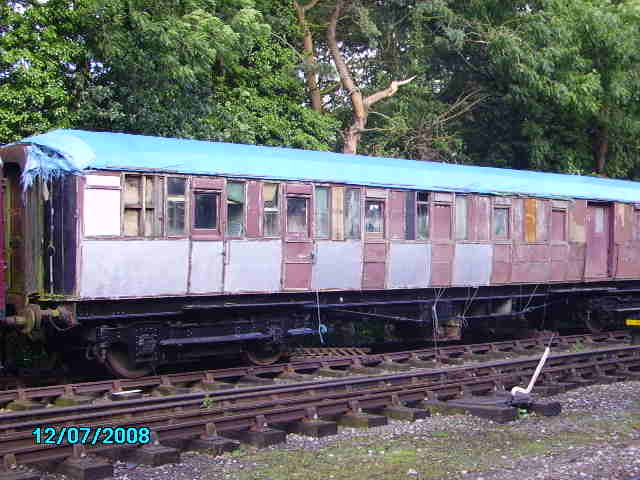 He was instrumental in obtaining the LSWR milk van no 5025 and helped in its restoration at Quainton Road. A practising christian, an extreemly successful and able librarian, owner of a Southern electric coach, co founder of the Kent and East Sussex Railway Preservation Society, an avid collector of 0 gauge trains and enthusiastic film maker. Whilst in Africa he became Commanding Officer of the Air Cadets, Chief Librarian of the Bulawayo Public Library, Librarian at the National University of Science and Technology and was current Magazine Editor for the Friends of the Bulawyo Railway Museum. 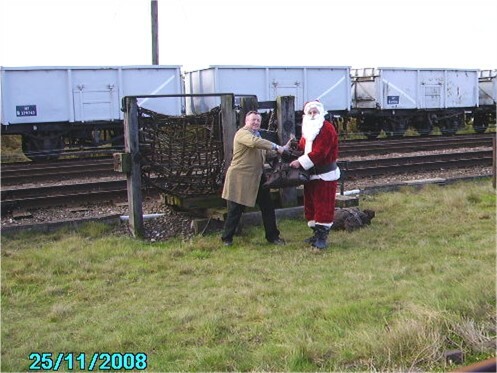 Robin made regular trips back to the UK and managed to vist GCR last in 2002 seeing the progress on our stock and TPO activities. He was buried on the 17th March at Bulawayo and a comemorative service was held in Ashford, Kent on the 31st March 2008. JOHN KENT - Sadly we have been informed that John died suddenly at home last week after a short illness. Although not actually an RVP member John was well known to many at the GCR through his manning of the buffet cars during gala events and regular visits to Rothley shed to check on progress. His conversation and interest in our work will be sadly missed. BEAVERTAIL BAR - The bar is now complete as the photo shows (prior to the application of the final coat of varnish. 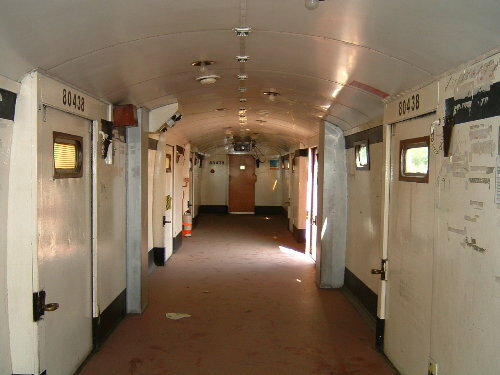 As can be seen, although not original, the bar blends in well with its surroundings, and has a rather more practical use that the mail compartment that previously stood here. NEWS UPDATE - Recent weeks have seen a very high level of activity. The rebuilding of the Mountsorrel railway continues to make excellent progress. A further donation of track materials from Snibston have been received and last weekend saw the first visit of a JCB to start preparing the formation for track laying. Meanwhile at Rothley this photograph perhaps best sums up the level of progress being made there - all three roads of the shed with RVP vehicles in, all of which were being worked on simultaneously yesterday. On the left Motorail van 96202 is part way through its repaint, the roof and underframe complete, the bodysides to be done shortly. In the centre BEAVERTAIL 1719E was having the finishing touches put to the bar and some small tables fitted. On the right our current long term restoration 24278 sees sustained activity, with roof work and frame repairs ongoing at present. 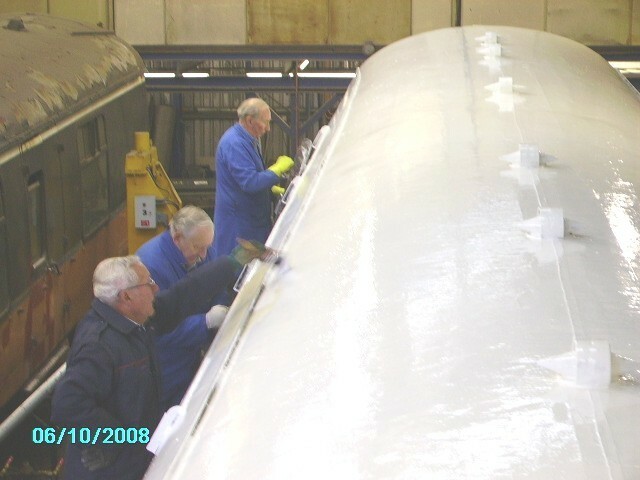 Not in the picture work is also taking place of TPO vehicle 80458 to fit it with dual brakes (to say nothing of the small team of members rebuilding a mark 1 buffet car - 1962 - as a privately funded project). All in all there is probably more going on now then ever. As the weather gets better why not come and join us? We should, of course, acknowledge the assistance of the GCR in allowing these vehicles space in the shed. BEAVERTAIL AWARD PRESENTATION - Yesterday saw the presentation of the Heritage Railway Association "Small Group" award to RVP Ltd for our restoration of Beavertail car 1719E. The award was presented by HRA president Dame Margaret Weston at University College London as part of the HRA's annual general meeting. The "trophy" is a coat of arms from a Royal Carriage, in a display case. 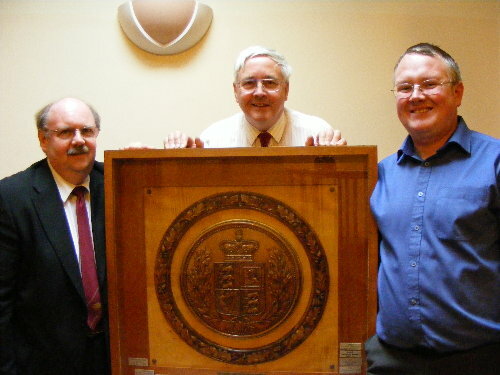 The picture shows Alan Voase, Gordon Maslin and Darren Martin after recieving the award. As can be seen it is a rather large and heavy item (as was proved when four of us carried it back to Kings Cross to put on a train:-)). Because of this, and insurance limitations, RVP are not able to house the trophy so it was returned to the care of the HRA after the presentation. However we hope to arrange a presentation ceremony at the GCR in due course, and (hopefully) it will then be displayed at Loughborough for the year. Many thanks to the HRA for the award, and congratulations to all who involved with this fitting end to a very successful project. GCR WINTER GALA 26/7th JAN - The timetable for this event has now been confirmed. There will be two TPO runs each day, passing Quorn at around 11:20 and 16:20; mark 1 TPO 80301 will be in action on these trains. 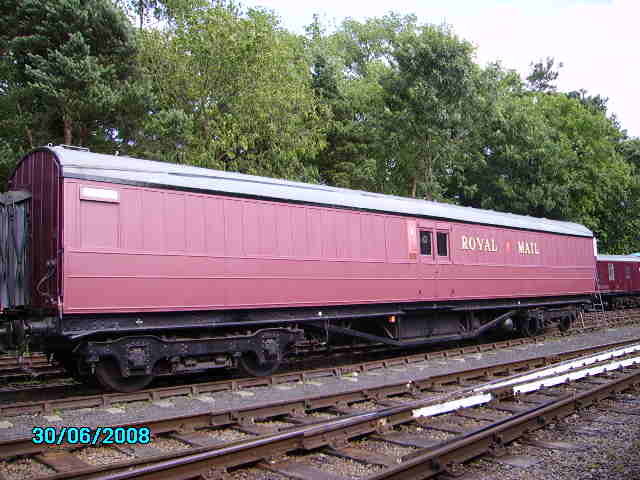 At Rothley the LNER TPO set will be on display and open for visitors, as will the Beavertail. The newly installed bar in the Beavertail will be christened by being used as the sales stand for the weekend. The shed will be open, with the increased progress on buffet car 24278 now very apparent. 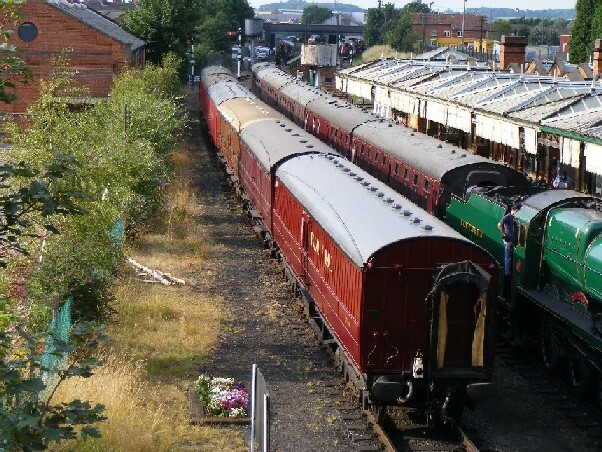 As usual the GCR will be operating an intensive service, details at their website www.gcrailway.co.uk. In addition visitors riding trains at the gala will be able to view the rapid progress on our NUNCKLEY HILL PROJECT, which is now actively rebuilding the Mountsorrel Railway from North of Swithland sidings out towards Nunckley Hill. 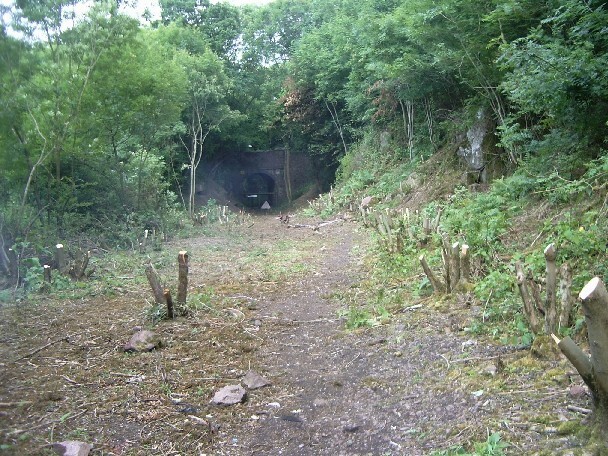 The track bed and sidings area is now largely clear and it is hoped signs of progress will encourage a flow of donations to this important project. NORMAN QUILTER - Sadly we have to report the passing away of Norman at the end of the last week. Very well known to all volunteers at Rothley, Norman was our oldest regular working member being in his mid-eighties. Despite this he turned up every Monday for the full day, and many Saturdays; being remarkably fit for his age his death has come as a surprise. During his working life Norman was an engineer for the gas board, and had been working for RVP for many years since his retirement. His ability to offer advice and guidance on virtually any problem, in a relaxing manner that made him very easy to talk to, means he will be sadly missed. Our sympathy to his family at this difficult time.